The Grasshoppper was founded in 1983 and has been a staple of Cedar Grove ever since. Whether you're stopping by to enjoy any of our great beers on tap or bringing the family in for a homemade meal you are sure to enjoy your stay! Commitment to our customers is the foundation of the bar and restaurant for the past 30 years. We hope you stop soon! The Grasshopper is family-owned and operated right here in cedar grove, NJ. Since our company opened in 1983, we’ve treated every customer like they were a part of our family. In the early 1980s the Fitzpatrick's moved over from Ireland with the goal of showing Northern New Jersey the true art of Irish Pub's. The family owns 3 bars all with a variation of The Grasshopper name. 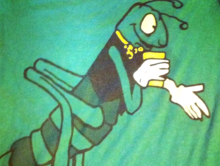 The other two, Grasshopper Too and Grasshopper Off the Green, are located in Wayne and Morristown NJ. When you visit our establishment's you are sure to meet at least one Fitzpatrick and it is that commiment to family values that allows our business to flourish!